Make bike parking noticed with the innovative RackiT™ Key Bike Rack. 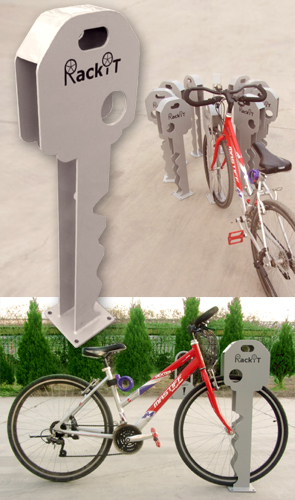 The artfully constructed Key Rack provides secure two point locking for a single bike parking in small or narrow spaces. Combining multiple Keys allows endless opportunity to create a signature bike parking lot. RackiT™ galvanized steel bike racks are maintenance free, weather resistant and sealed with a high quality silver powder-coated finish. These one of a kind racks are simple to use and install, great to make a statement at parks, home, apartment or schools.